SQLite is a light weight, fast, easy to use (because no configuration or setup is required, it just works!) SQL Database Engine. Due to its small size and efficiency, it is now one of the most popular database engine (Android Apps uses SQLite database for handling persistence data). If you are using Ubuntu as a development platform where it’s a Rails Apps or Android Apps or something else, you may need to browse/analyze database visually using GUI tool. So having a graphical browser for SQLite database seems a good idea. There are many GUI tools for SQLite databse but SQLiteman seems to be a good one. SQLiteman is database admin tool for sqlite3 database and of course it has easy to use graphical interface. It’s a free software, available for all platforms, in Ubuntu or most of the GNU/Linux distributions you can find it in the official package repository. So in Ubuntu, Linux Mint you can get it from Software Center or synaptic package manager, otherwise use command line tool such as apt-get or aptitude. SQLiteman Manual – Official usage guide, recommended to read if you need some help regarding this tool. How do you open MySQL database with sqliteman? 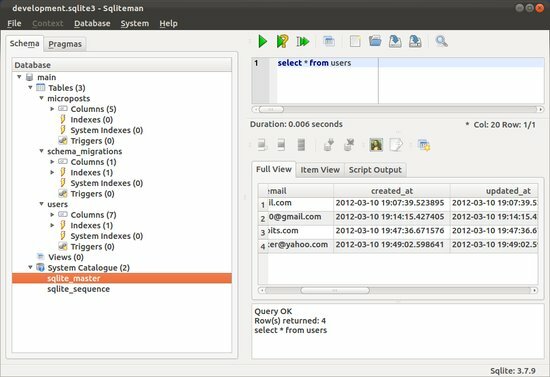 I have MySQL db running on ubuntu, and would like to see it using sqliteman. Do I have to convert MySQL db into a sqliteman db for this to work?